You are at:Home»Football»5 quick hits: Navy's future football home settles on "American Athletic Conference"
Courtesy of BigEast.org (for now). Big East, we hardly new ye. Or, in Navy’s case, we never knew ye. 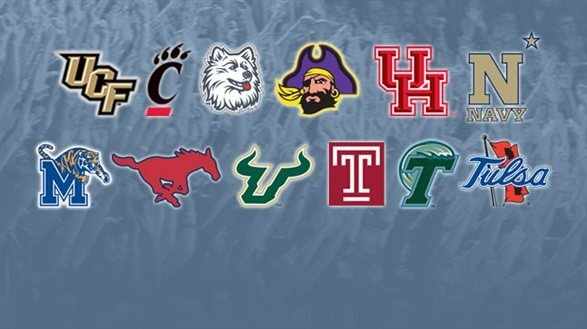 At right, a nice graphic of the 12 schools that will make up the American Athletic Conference in 2015; all but Navy will be in place by 2014 for all sports, the Mids will be football-only members. 1. Branding 101. The name “suggests a national scope and quality membership,” an ESPN official said in the news release announcing the change. Some might say the name is fairly similar to this name, which doesn’t really do either of those things. Ask Army. 2. How do you pronounce “AAC”? If you’re about to make a “cat with a hairball” joke, you’ll have to get in line. 3. More membership moves? A new name doesn’t say much about a league’s individual members, but having “American” in there lends a bit of credence to a report that Army and Air Force would be welcome additions, likely joining with Navy as part of a military-heavy division. Neither the Black Knights nor Falcons have expressed interest. 4. Facts and figures. More fuel for expansion/contraction rumors: The new name doesn’t include the standard — and often inaccurate — number of conference members. “America 12” reportedly was being considered last month. This could be a simple branding decision, or an acknowledgement that membership could fluctuate fairly quickly. 5. About that logo. The release promises some designs “in the coming weeks.” Expect some stars and/or stripes.